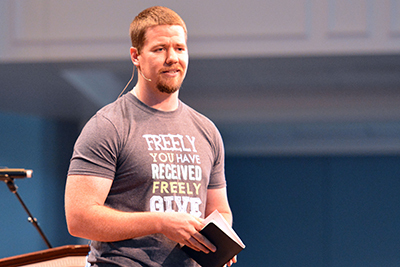 Osteen, drawing from Isaiah 55, encouraged students to give without cost because they have received without cost. "God's economy is not like our economy," he said. "At great cost to Himself, He has given freely that we might receive freely." He also challenged the missionaries to give without hesitation or reservation. "You are His ambassador and He has entrusted you with His message to speak the truth," he said. "May the truth pour out of you like a river. I hope you will look back and say, 'I held nothing back. I have no regrets. I kept nothing on the table.'" 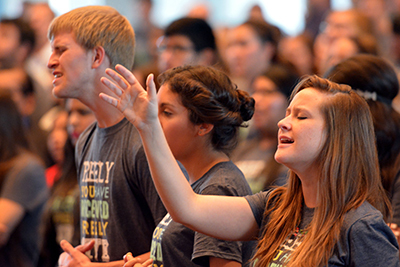 More than 280 students will serve through Go Now missions this summer, some on short-term Impact teams to places like Alaska or the Valley of Texas, and others serving 10 weeks from New York to the Philippines. For Kasen Tey, a student at the University of Texas at Austin leading a team to the Philippines, having a heart of prayer all summer is an aim. "I'm expecting God to teach me, challenge me, grow me, push me out of my comfort zone and to see how I can depend on Him in a different culture," he said. Chelsea Turner, from the University of North Texas, will be serving in Fort Worth but doing international work as she ministers to refugees. Go Now Orientation was helpful to Chelsea as she saw the body of Christ united together with the common goal of spread the Gospel worldwide. "It's encouraging that we are all doing this together, even though we will be miles apart," she said. "The body of Christ is not confined to a building or place." During the weekend, students were encouraged to list out their "cloud of witnesses," reflecting on Hebrews 12. For many, names like Mom and Dad were included. On Sunday afternoon, many of those witnesses stood alongside their students and prayed over them and the work God has in store. Mark and Debbie Boucher gave a word of encouragement to the parents and families sending their students out. The Bouchers are Go Now parent veterans, having had all four children serve across 10 states and five countries since 2003. Their youngest son, Josh, is now serving as a campus missionary at Texas A&M University. "You have to realize that this out of your hands," Debbie said. "Our children are actually beyond us. God is challenging you to go deeper than ever before. God's nature is good. He is a giver. We should model what God does. We should always open-handedly give - including our children." 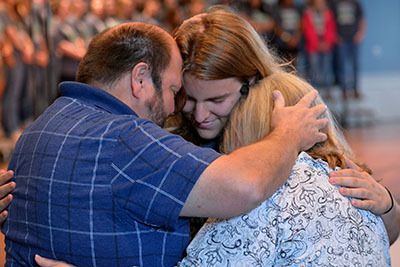 Debbie also encouraged parents to pray hard and earnestly for their students, an action all Texas Baptists should join together this summer to do. Look for updates from Go Now student missionaries this summer at gonowmissions.com.